Between large-chunky retro headphones like Beats by Dre and vintage record players, the outmoded is now in. Record players and vinyls are not just another prehistoric item that your grandparents take out of their dusty garage but items that are trendy. According to WGSN, trends usually start with just one person, an early adopter, then moves to an early influencer, after this it reaches high fashion and media. Just like a 60’s-esque pair of bootcut jeans, previous forms of listening to music have resurged. Is being ‘old-fashioned’ just something that will die out again, or is it here to stay? 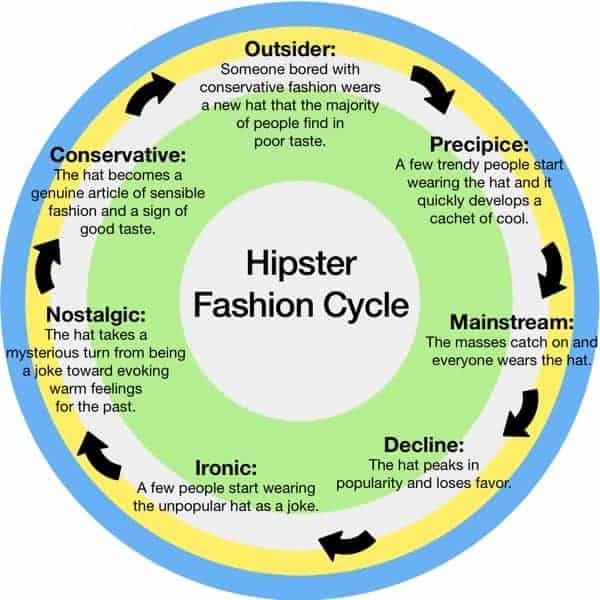 According to the Daily Infographic, The ‘Hipster Fashion Cycle’ could begin in the nostalgic. For example, when your parents put on their chunky-black headphones from the 1980s, they remember plugging it into their boom box as a teenager. After it resurges, it reaches the mainstream and declines the headphones will be ‘Ironic.’ Like clout goggles, headphones will be looked at as something silly from the past. After some time, it is likely that they will resurge again, with a bit of an update, and gain popularity. Chunky headphones are a way of listening to music that has been around for generations; however, the headphones of our parents’ past, have evolved. In recent years, headphones began to switch to bluetooth. Upon the advancement of newfound technology, Apple decided to remove their headphone jack with the release of the iPhone 7. In order to compensate for the missing headphone jack, Apple unveiled AirPods. Although Beats by Dre are chunky retro headphones that also use bluetooth technology, they don’t appear to have the same social media buzz AirPods.The small bluetooth earbuds retail for a hefty price. “Charging $159 for AirPods? Damn I better be able to hear Harambe’s last words before they shot him,” says one meme. Beats by Dre retail from $199.00 to $699.99. The price of Beats are higher, but AirPods seems to be a sign of socio-economic mobility.